Baron Drednought Steampunk Aviator Hat Fabricated by Designer TJP! During The Great War, a lone Black Spanish Moor from a noble high-ground Andalusian family, joined the French Elite Air Defence Squadron (FEADS) to help battle high-combustion Death Walkers that mercilessly sprayed the bludgeoned countryside with a multitude of Self Seeker Bombs (SSBs). People nervously asked just who was this audacious Sky Pilot and why did he fight for his allied neighbors with such courage? Well the glorious enemy quit asking about the Airman. After suffering a continued series of deadly dogfight defeats, they simply named him Baron Drednought and now fear for their lives! 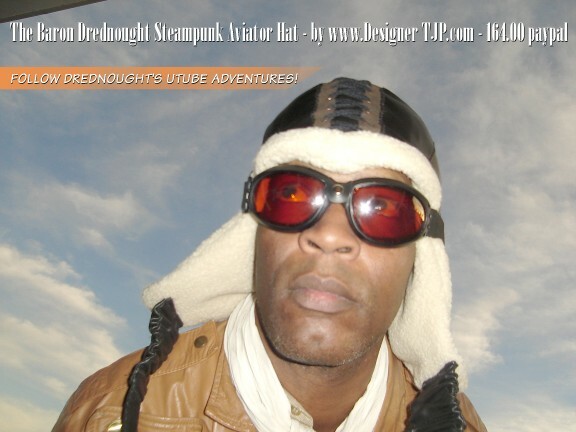 Hello, the collectible Baron Drednought Aviator Hat, "Sky Goggles" not included, is Fabricated by Tuck John Porter (the FX Costumer who helped construct the "Bio-Mechanical Warrior Robots" seen in the cult hit Sci-Fi movie "Space Truckers" Directed by Stuart Gordon). 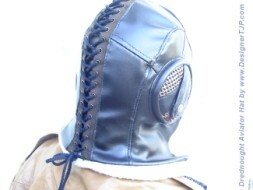 Sized to comfortably fit an Adult Male with a head circumference of 24.75" inches (62.86cm) or less. This Steampunk Aviator Hat is built with black pleather, brown lace eyelet trim, brown foam ear pads, black lace cord, and is inside lined with white faux sheep fluff. 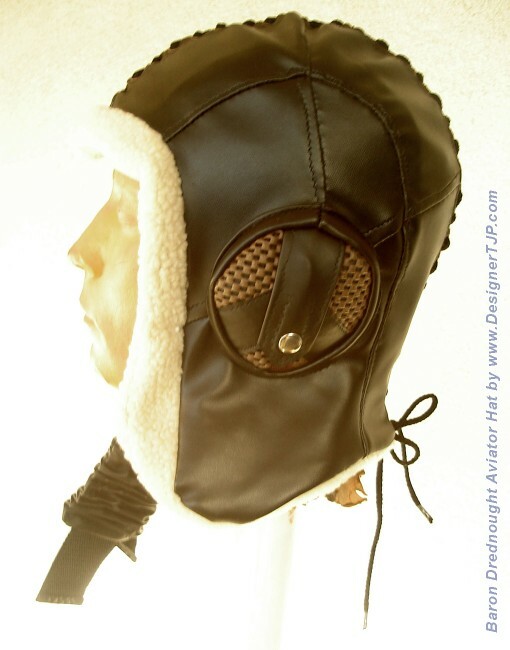 This Aviator Hat is "Buckle-Free" under the chin, making it Go-Go Dance Proof (no moving metal in that area to accidently chip your teeth while gyrating high on a podium 20 feet above the dance crowd). 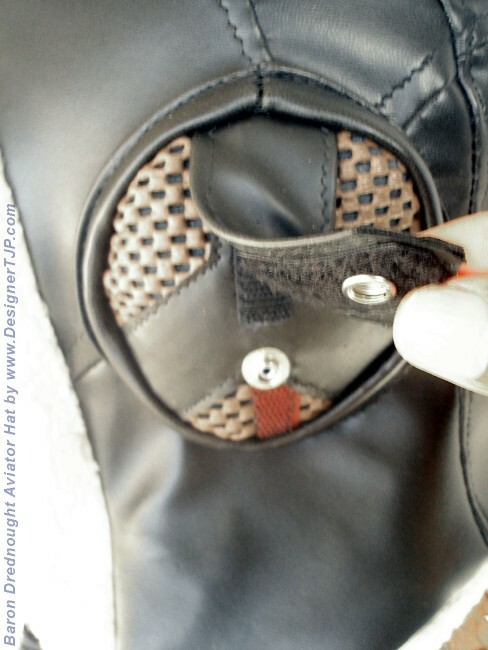 Velcro is used instead, but we recommend you leave it open and let the straps "hang down" for a cool relaxed look. 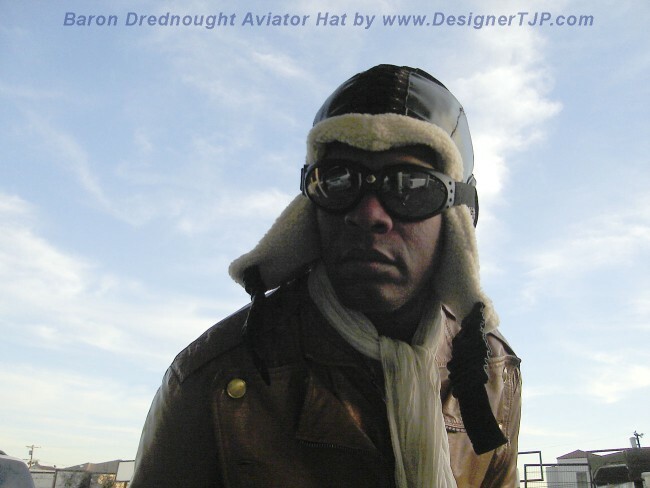 Buy The Baron Drednought Aviator Hat today and protect your head in the Future World of Steampunk, which evolved from an Edwardian Past that never was. 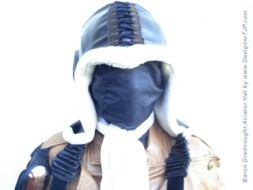 8.65 Will ship the collectible Baron Drednought Aviator Hat to anywhere in the USA. International Buyers, please add an aditional 14.35 U.S. Dollars for International Priority Service. The Allied Canadians will pay a little less in Shipping Charges. Please allow approx. 3 work days from your PayPal Payment for time of shipment. Cheers! The Designer Manufacturer notes materials colors and actual shape silhouette are subject to change since this is a new prototype product.